At any dental practice, the dentists seem the be the star of the show, but nothing would happen without dental assistants. Dental assistants help to keep the practice’s day-to-day operations running, they help dentists see more patients each day, and they help dentists use time more efficiently, as 92.1% of responding dentists reported in a survey from the American Dental Association. When a dental assistant has these important skills, they’ll shine from a dental school clinic straight through to employment at a dental practice. Ability To Focus On Details: An effective dental assistant is expected to follow an array of rule and protocols that are in place to protect patients. To follow these rules, they must be concentrating on details. 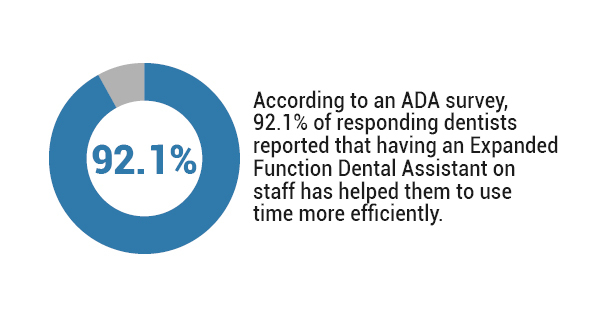 Detail-oriented dental assistants are also able to focus on the issue at hand and the best way to correct it, following through until the issue is resolved correctly. A focus on detail comes in handy in more menial, daily tasks as well that are just as important in a dental school clinic. Interpersonal Skills: A major part of being a dental assistant is interacting with patients every day. These patients may be in extreme pain or mental stress, so an assistant must be skilled at emotional sensitivity, conflict resolution, and mediation. An assistant should be skilled in both verbal and nonverbal communication in order to solve any problems at a practice. Organization Skills: A dental assistant should know how to be physically organized as well as mentally organized. Practical dental assistant training courses will help with how to best organize a dental workspace, but an assistant is often more effective when they have good time-management skills and multi-tasking abilities. All of these require an innate sense of organization. Dexterity: On a daily basis at a practice, a dental assistant will have to work in tight quarters with their hands on a very small part of the body. On top of that, an assistant has to use precise tools and instruments and this requires absolute control over their hands. Passion: Most of all, a dental assistant needs passion in order to succeed at a dental school clinic and in the real world. A love for helping patients and assisting a dental team in their practice will drive a dental assistant to be great. A dental assistant can wear many different hats over the course of just a day while they assist a dentist, so they need to be prepared for this work with many different skills.